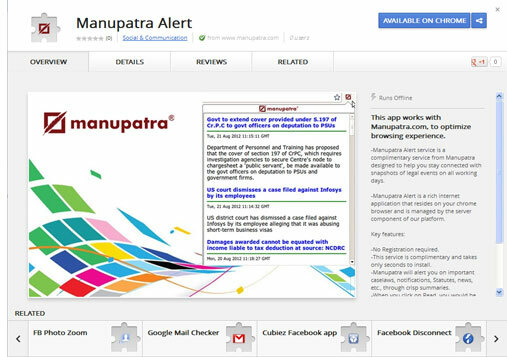 Manupatra Desktop Alert service is a complimentary service from Manupatra designed to help you stay connected with snapshots of legal events on all working days. Manupatra Desktop Alert is a rich internet application that resides on your desktop and is managed by the server component of our platform. This service is complimentary and takes only seconds to install. Manupatra will alert you on important caselaws, notifications, Statutes, news, etc., through crisp summaries. When you click on Read, you would be able to read the full article/update, etc. New Information flows on to your desktop so you don’t have to access different sites to keep yourself updated. Does not interfere with your work. Desktop Alert remains in your Windows system tray. As soon as an alert is received, it “pops up”. Zoom In and Zoom Out feature is available. Select Run to install immediately or Save to save the installer to disk or drive. Double-click on the Setup.exe file to install. Share Manupatra Desktop Alert with your friends and colleagues. Desktop Alert on Chrome service is a complimentary service from Manupatra designed to help you stay connected with snapshots of legal events on all working days. Does not interfere with your work. Alert remains in your Browser.